The purpose of this post is solely for gloating. I generally don't like to gloat. It usually makes others, the "gloatees," feel bad and the gloater really doesn't gain that much either. But I'm putting all that aside and directing this gloating session at someone specific. Today's gloatee is my mom. Boy, that sounds mean. Why would I want to taunt my own mother? I don't really have a good reason other than pure competition. But she started it. About 3 or 4 years ago, my mom brought me a teensy fig tree sapling. It was about 6 inches high. She had one just like it and we both planted them in our yards. My yard is in Maryland. Her yard is in Tennessee. We were told by the Tennessee fig man who gave her these saplings that it would take about 3-4 years before the trees would fruit. In the intervening years since planting, she has asked frequently, "How's your fig tree?" "It has grown, " I would say. Neither one of us has any real idea how to care for a fig tree so we both do little to nothing for our trees. My tree has survived 55+ inches of snow in one winter. Her tree has survived near-drought conditions. But surprisingly, both our trees are thriving. So what do I have to gloat about? This is it! Right on the 3-4 year schedule! Sadly, my mom's tree has not fruited. I'm sorry. Really, I am. But I am sure that her tree will fruit next chance it gets. When she found out that my tree had fruit, she gave her tree a good talking to. She let her tree know how disappointed she was that it would let a Maryland fig tree, that is living in the wrong climate, dealing with the worst winters in years, show up a good Southern fig tree by fruiting first. I am certain that Mom's tree is very clear on the expectations for it next fruiting season. To drive her point home, Mom glares regularly from her kitchen window at her barren fig tree. She used to glare at me like that so I know how effective her glower can be. In the meantime, I am showering my fig tree with praise for a job well done. LOL! I can just see your mom talking to the tree! Well of course being such a wonderful mother I gave you the best fig sapling. 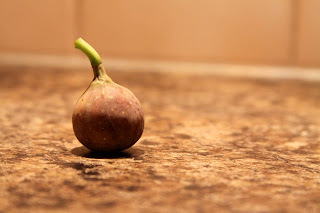 Just to let you know I have not spoken to my fig tree in days--nor even gone close enough to see if it might have a fig.But I'll check tomorrow---who knows the glares might have worked--although they weren't always effective on you. I am sure neither include gloating in them!!!!!!! The Parable of the barren fig tree is a parable of Jesus recorded in the Gospel of Luke 13:6–9. A vinekeeper holds out hope that a barren fig tree will bear fruit next year.